The so-called indirect buffer tanks contains coil exchangers, therefore they are able to heat water from multiple heating systems. These tanks are commonly used in case of a multiple heating sources use at once, for example solar collectors or heat pump. Buffer tanks with one steel coil in bottom part of the cylinder is marked as 1V (e.g. LMG 1000 1V or LMT 800 1V). A buffer tanks with two steel exchangers are labeled by 2V. Picture below shows a simple example of an appliances and their connection to a buffer tank. Boiler is connected directly to the buffer tank. 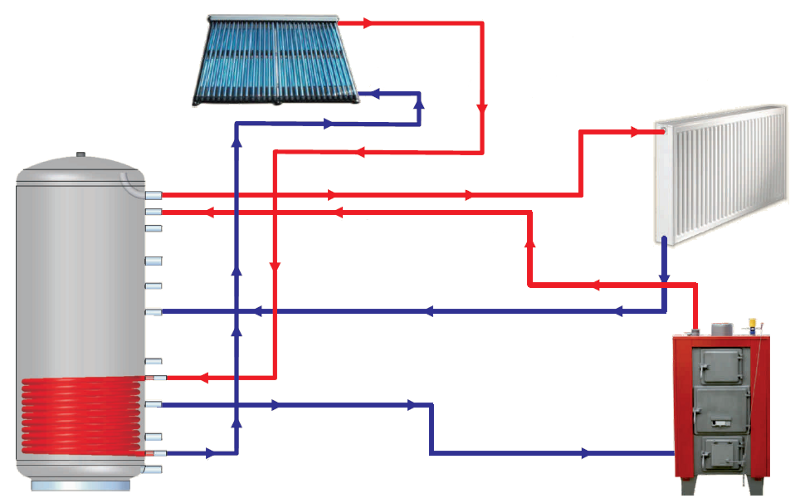 Heated water from a solar system flows through the bottom steel coil. Due to a spiral shape of the steel coil, water is heated in a whole cylinder. The performance of the exchanger depends on a heat-delivery surface size. An LVT or LSX buffer tank types can be used in the same way as LMG. Other buffer tank type, LMT is in addition suitable for indirect heating of hot water. Mild steel coil is not suitable for direct hot water.